As I sit and type this I cannot quite believe what is happening. In fact, because I am so stunned, I am having to write this down just to make it seem real. Two days ago I had a thought. I had been scrolling through my Facebook news feeds for both my personal and page accounts and I noticed something. So many of the wonderful artists and crafters that I follow were posting that their reach was down. I mean a lot of them. Almost everyone had said that within the last week, they were struggling to reach even ten percent of their followers. The networking pages were saying the same. There was a lot of speculation whether people shouldn’t post pictures or put a link in their post or limit the amount of hashtags. The rumour was that text only was the way to go. The conclusion was that Facebook was trying to make everyone pay to get their posts to the people that had already liked their page. It seemed unfair and quite worrying. After all, I am only a little page compared to others out there. If they were struggling, how the hell was I going to get anywhere with my fledgling business? I love the people that follow me. I love reading their comments, I love their interaction. I love how they are willing to share their makes with me and vice versa. I didn’t want to lose that. And so as I scrolled I had a thought. It was a little thought that tumbled around in my mind and as it tumbled it began to grow. 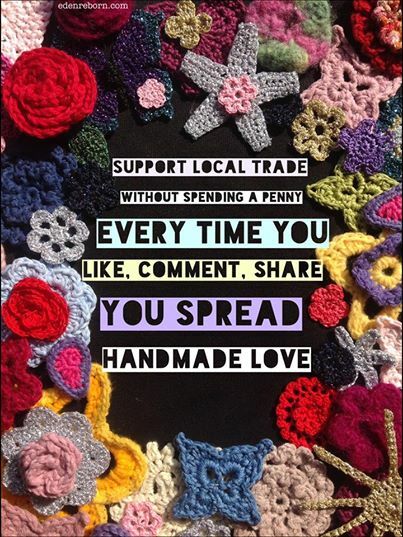 The thought was this: I wonder if there is a way to remind people that supporting handmade business doesn’t have to involve money? Every time someone clicks the ‘like’ button, everytime someone leaves a comment on a post, everytime someone is kind enough to share a post. They are all helping to support that page. And that action could be the difference between that business finding a potential customer and surviving or being another dream that falls by the wayside. I wondered how to articulate what I was thinking in a way that didn’t put guilt or pressure on people. I wanted something that would conjure hope not obligation. I wanted people to feel inspired. I have a box of crocheted flowers. Little things I have played with and tried out over the years and never used. I grabbed that box and a black cloth. I laid out the contents in the shape of a frame, leaving a gap in the middle for some text. I played with the arrangement until I was happy with how it looked and then I took a photo on the iPad. I opened up a free app I have called After Photo and I added some text. It was nothing ground-breaking. Just a little friendly reminder that every click is a way to share some handmade love. It is becoming increasingly hard for small businesses with little advertising budget to compete against corporations with millions of dollars in the bank. We are almost entirely dependent on social media to display our wares, connect with potential customers and make new friends. Pages who have thousands of followers may still reach a handful of their fans with their posts. Seems unfair eh? You can help! Every time you like, comment or share a post from your favourite page, you help to increase their reach. One little click could be the difference between them making a sale or them failing. Without spending a single penny, you have the power to shape the world as you want it to be. Help local businesses. Spread handmade love. And I pinned it to the top of my page. I then went across to a couple of other networking pages and share it to their wall and then I waited. The likes began to come in. So did the shares. Before I knew it, that one little picture that took me five minutes to make on the iPad had reached over a thousand people. The shares kept coming. As I sit and write this 48 hours after I first posted it, that picture has reached over 7,500 people, which for a little page with less than 700 likes, ain’t bad. I am so very grateful for that I can’t even begin to articulate it. Has it got my page a whole load of new likes? No. Has it proved that it is completely possible to increase your Facebook reach without spending any money on advertising? Absolutely. To be fair, I never posted this with the goal of gaining myself new likes. I want people to like my page because they genuinely want to. I want people who will inspire me and laugh with me and who are willing to wander a while on this crazy journey called life with me. I want friends, not followers. And I wanted to prove that social media can be used in a positive way to transform the situation in which we find ourselves. I wanted to prove you can increase your Facebook reach without paying for advertising. I wanted to inspire people to not just sit there and take the hit on their visibility. I want to tell you that you absolutely CAN do something about it. All it takes is a little imagination. I have always been a big fan of social media. Never before in the history of mankind have we had the opportunity to reach so many people in such a little amount of time. We can talk with people on the other side of the globe with a single click of a button. Information can be shared across continents within seconds. We should be celebrating that. I know it’s easy to get caught up in your own sphere of experience and not be able to see the wood for the trees. But we have to pull together and stop being little islands shouting at each other from a distance. Gandhi said, ‘We have to be the change we want to see in the world’. If we want people to engage more with us, we have to be willing to engage more with them. We can’t want people to like, comment or share on our pages if we are not willing to do the same to theirs. I know it’s hard. I know there are only so many hours in the day. I know we all have lives and family and work and commitments. But we have to find the time to put the social back into the media. For everyone’s benefit. Because as Albert Schweitzer said, “Life becomes harder for us when we live for others, but it also becomes richer and happier”. So call it what you want: pay it forward, random act of kindness, doing a good deed. Next time you are scrolling through your feed and see something that you like, click the ‘like button’. If you feel like saying something, then say it. And if you want to share it, then do. That one little click could be the thing that changes someone’s life for the better. Posted in Uncategorized and tagged Crochet, Facebook, Imagination, Social Media. Great and inspirational post. Thank you ~ I am going to share with my page. Hello! I found this posted on my wall in the wonderful world of Facebook…via the wonderful Crochet In Colour. Now I am going to go check out your FB as I love what you had to say. See you around and thanks for the pretty note. Have a great day.